Duncan Campbell's Blogsite: Split Fest - Temple Basin New Zealand, Keeping Fit. Split Fest - Temple Basin New Zealand, Keeping Fit. Awesome few days at my first Split Fest held at Temple Basin up in Canterbury NZ. Apologies for the lack of posting - I have basically been doing lots of gym, running, biking and I really like the fitness you gain split boarding - so took the opportunity to shot up to this years Fest. Met some amazing people - lots of things to learn and great new places to go exploring. Here's a shot of the cabin we were staying in as we left early Saturday morning to go touring. Temple Basin hut - had a few learning curves on the "nut-cracker tow". 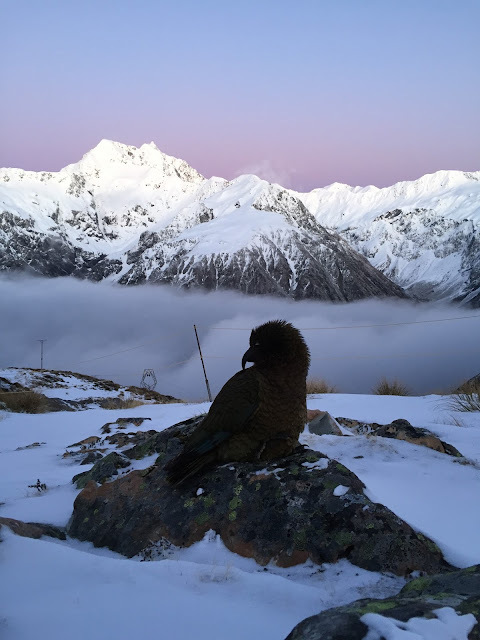 My favourite NZ mountain bird the Kea - was also up early looking for OPPORTUNITIES!! Had a day to get back to Queenstown so went exploring around this amazing country - ended up driving over 3 Alpine Passes in one day. Left Temple Basin and headed over Arthurs Pass down the West Coast then over the Haast Pass back to Queenstown via Crown Range. Ha, by the time I got to Bruce Bay on the West Coast - I was keen to stretch the body - so had some entertainment with the Go Pro - good thing, I don't think anyone was watching. Here's my best attempt at Karate Kid.